To release the parking brake, first apply the foot brake and pull up the parking brake lever slightly. 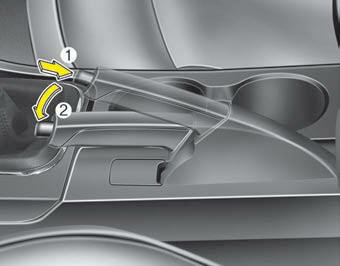 Secondly depress the release button (1) and lower the parking brake lever (2) while holding the button. If the parking brake does not release or does not release all the way, have the system checked by an authorized Kia dealer. Check the brake warning light by turning the ignition switch ON (do not start the engine). 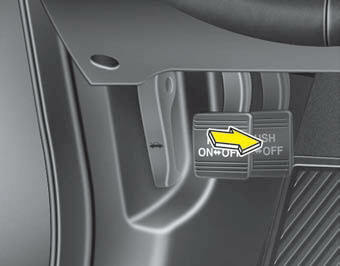 This light will illuminate when the parking brake is applied with the ignition switch in the START or ON position. If at all possible, stop driving the vehicle immediately. If that is not possible, use extreme caution while operating the vehicle and only continue to drive the vehicle until you can reach a safe location or repair shop.